Benjamin Franklin was the American prototype: hard-working, inventive, practical, funny, with humble manners and lofty dreams. 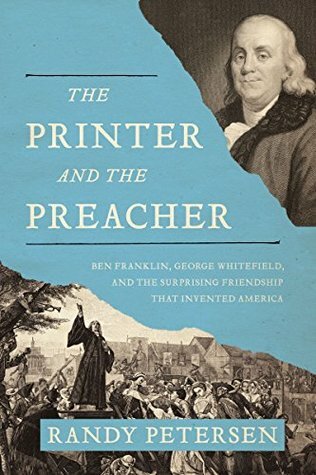 George Whitefield was the most popular preacher in an era of great piety, whose outdoor preaching across the colonies was heard by thousands, all of whom were told, ôYou must be born again.ö People became excited about God. They began reading the Bible and supporting charities. When Whitefield died in 1770, on a preaching tour in New Hampshire, he had built a spiritual foundation for a new nationùjust as his surviving friend, Ben Franklin, had built its social foundation. Together these two men helped establish a new nation founded on liberty. This is the story of their amazing friendship. This was a very interesting book. I enjoyed reading Benjamin's biography as well as George's. I did not know who George was before reading this book. I have learned some more history by reading this book. There were parts of this book that read quickly and parts that were kind of dry. But the book was packed full of information and a good book for a history lover like me. I am glad I got the chance to read this book. I thought the cover was ok. It was nice to see pictures of both people on the cover. Randy Petersen has written more than fifty books on subjects ranging from history to relationships, psychology, sports, and even word games. Formerly an editor and writer with Christian History magazine, he also prepares curriculum for small-group Bible studies. Apart from his writing, Randy teaches public speaking at a community college, preaches occasionally at his church, and directs in area theaters. He lives in the Philadelphia area. I loved this first book in this new series. For me it was the Scottish aspect that drew me in first then the ghost part was an added bonus. 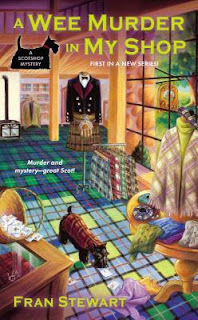 I liked that part of the book took part in Scotland and wished a little more of it was there but the fact that the Scotsman ghost comes back with Peggy is pretty fun. Poor Peggy trying to talk to her ghost without people really knowing what she was doing - it was kind of fun to listen to but I did feel bad for her. I love all things Scottish so all the little tidbits were great for me. The author did a very good job with the mystery as you had no idea right up until the last few pages. I am anxious to read the next book as I can't wait to see what is up with Gilda and the twins and what happens next with Peggy and her ghost. A great start to a new series. I thought the cover was cute. It showed the inside of a Scottish shop which fits this series perfectly as that is where most of the story takes place. Fran Stewart is the author of the Biscuit McKee Mysteries. 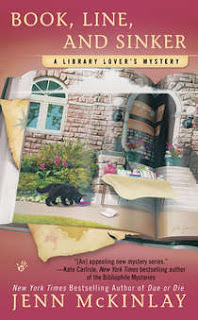 She is a member of Sisters in Crime, the Atlanta Writers Club, and the National League of American Pen Women, and lives simply in a quiet house beside a creek on the backside of Hog Mountain, Georgia, with various rescued cats. She sings (alto) with the Gwinnett Choral Guild, knits, reads, gardens, volunteers in her grandchildren’s school libraries, and manages quite happily without a television set. "Avast" in pirate speak means what? or stop! I loved this book just as much as I did the other two. I like reading about all the characters and wish I lived in this town so I could join the crafternoon club and be friends with them. Lindsey always seems to somehow get herself mixed up finding a dead body and then trying to find out who killed the person. Another thing I liked about this book was the pirate theme that this story took along with the little bit of history of Captain Kidd. There was quite the turn of events in the end of the story - the killer part I was happy with - the Lindsey/Sully part I was not so happy with. I can't wait to read the next book to see what happens next. I have liked the covers of each of the books in this series. I like how the library is there, books are there, Heathcliff is there as well as a map. It ties the whole story together. I am a fan of historical fiction book so this book jumped out at me when I was offered the chance to read it. This is the first book that I have read in this trilogy and I had no problems with it as each book can be a standalone book. The author did a very good job with her research and it shows in her writing. 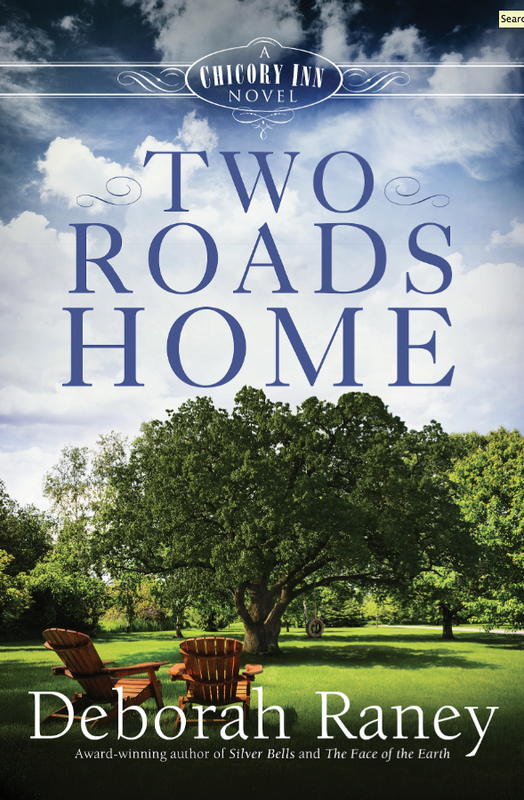 There is so much going on in this book with living in court such a betrayal and mystery. Penelope Devereux is just one player in the Elizabeth’s court and it was interesting to learn about her and the part she plays. I had not heard of her before so it was fun to learn more about her. The details that the author used in her writing was very detailed so you felt you could really see, hear and feel what she was talking about. The writing style flowed nicely which made the story easy to read. I will now be going back and getting the other two books in this series. I think the cover was done very in a classical way. I like how there is a picture of a woman but does not show her whole face so you can still make your own picture in your mind of what she looks like as you read the book. As a child I was the one in the corner with my nose in a book who wanted to be a writer, but with the onset of a turbulent adolescence I left school, under a cloud, aged fifteen with nothing more than a fistful of O Levels and a hapless sense that things would somehow work themselves out. Eventually, after working in various dodgy dives – I've served grey scrambled eggs to squaddies at 5.30am; I've served vintage champagne to raucous hoorays; I've pulled pints for all and sundry – I managed to find myself, much in the way Forrest Gump always landed on his feet, working as a dogsbody on a fashion magazine. Over a decade, I worked for titles such as Vogue, Elle and The Sunday Times and contributed to many others. Marriage took me to Paris, a stint at French Vogue and the birth of my two gorgeous children but divorce saw me back home in London where I have happily remained. Fuelled by frustration with a fashion world that does no favours to women, I decided to complete my truncated education as a mature student which led, in a long and roundabout way with many frustrating impasses, to my fulfilling that childhood dream to become a novelist. Elizabeth has a first in English and an MA in creative writing from Birkbeck, University of London. She has contributed to various publications including The Sunday Times, Vogue, Vanity Fair, The Financial Times and the Wall Street Journal. She also reviews fiction for The Sunday Express. I was a big reader as a child and for as long as I can remember have been writing stories. I’m a pragmatist and prefer not to believe in writers’ block. It’s true sometimes the writing becomes difficult but the only solution is to write – anything at all, even if I know it’s nonsense – and something will eventually happen. I find walking is good for unlocking ideas and if I really feel I’m getting nowhere at my desk I’ll take my dogs out for an hour. 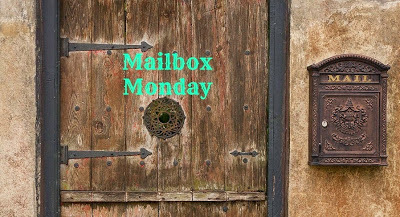 I write an absolute minimum of 1,000 words a day, but its usually about 1,400. Discipline is the cornerstone of my work regime, so I’m very strict with myself, otherwise nothing would happen. As I write about real characters from history, inspiration springs from reading about their lives. But there is always an underlying idea that is more abstract; for example in WATCH THE LADY I was exploring the notion of loyalty and the fact that loyalty can, if taken to an extreme degree, drive a good person to ill deeds. I’m a great film buff and love seeking out screenings of old movies from the 1930s. I visit historic sites for research but it is something I would do even if it wasn’t necessary for work. My children no longer live at home but family plays a really important role in my life – just hanging out, walking the dogs, or going for a meal together. They are both quite foodie, so we’ll occasionally treat ourselves to an evening in a Michelin star restaurant. 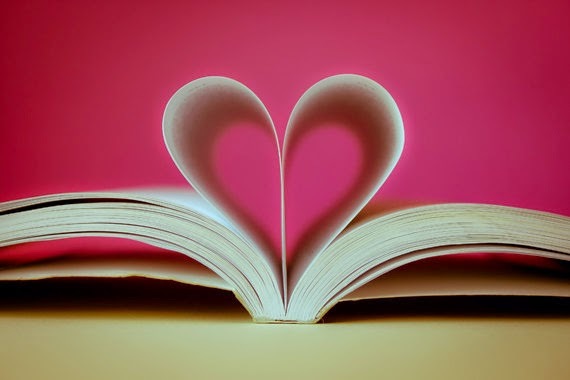 I have two pieces of advice: read more because other writers are the best teachers – you can even learn from a bad book in analysing the ways it doesn’t work – and develop thick skin because rejection is part of the deal, I’m afraid. One of my favourite books is BEWARE OF PITY by Stephan Zweig. Set in Germany just before the first world war, it is an extraordinary feat of writing, exploring the idea of pity as a destructive force and describes a class-bound world that is about to be turned upside down. Elizabeth I might be interesting, though I imagine she’d be rather tricky! I’ve never been to Rome and would love to go. I was sent to boarding school aged eight. I managed to get myself expelled from two schools. I went to university when my children were little. I was a Vogue fashion editor in my twenties. I lived in Paris for three years and speak very bad French. This giveaway is open to the US only. 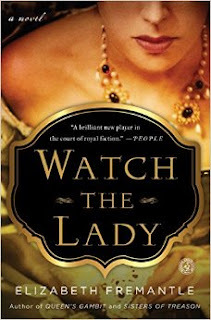 It is for a signed copy of Watch the Lady by Elizabeth Freemantle. The winner will be drawn randomly by rafflecopter and then will receive an email. You will have 24 hours to respond or a new name will be drawn. I really enjoyed this book. My daughter and I also watch this TV show on PBS and have enjoyed it. The author broke the stories up so that each chapter was a story which made the book very easy to read. Although there were times I found myself wanting more of the story or more history of the nuns that she lived with. 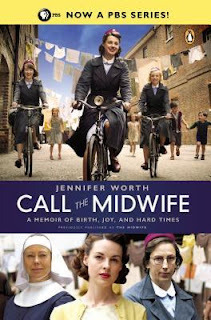 The author has so many stories to tell from her experiences as a midwife and let me tell you that some of them are so strange that you may find yourself shaking your head. I will be getting the second book to read in the very near future. I have the version shown above and I like it because as I said before I am a fan of the TV show. The characters are well known to me now and I like how this covers shows many of them. Worth, born Jennifer Lee while her parents were on holiday in Clacton-on-Sea, Essex, was raised in Amersham, Buckinghamshire. After leaving school at the age of 14, she learned shorthand and typing and became the secretary to the head of Dr Challoner's Grammar School. She then trained as a nurse at the Royal Berkshire Hospital, Reading, and moved to London to receive training to become a midwife. Lee was hired as a staff nurse at the London Hospital in Whitechapel in the early 1950s. With the Sisters of St John the Divine, an Anglican community of nuns, she worked to aid the poor. She was then a ward sister at the Elizabeth Garrett Anderson Hospital in Bloomsbury, and later at the Marie Curie Hospital in Hampstead. She married the artist Philip Worth in 1963, and they had two daughters. Worth retired from nursing in 1973 to pursue her musical interests. In 1974, she received a licentiate of the London College of Music, where she taught piano and singing. She obtained a fellowship in 1984. She performed as a soloist and with choirs throughout Britain and Europe. She later began writing, and her first volume of memoirs, 'Call the Midwife', was published in 2002. The book became a bestseller when it was reissued in 2007. 'Shadows of the Workhouse' (2005; reissued 2008) and 'Farewell to the East End' (2009) also became bestsellers. The trilogy sold almost a million copies in the UK alone. In a fourth volume of memoirs 'In the Midst of Life', published in 2010, Worth reflects on her later experiences caring for the terminally ill.
Worth was highly critical of Mike Leigh's 2004 film Vera Drake, for depicting the consequences of illegal abortions unrealistically. She argued that the method shown in the movie, far from being fairly quick and painless, was in fact almost invariably fatal to the mother. Worth died on 31 May 2011, having been diagnosed with cancer of the oesophagus earlier in the year. 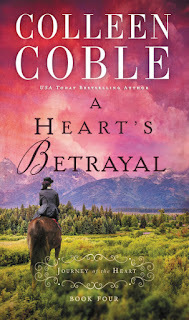 I thought this was a nice romance book to read. It would make a good book to take to the beach or to sit down and read on a rainy day. The character development was very good, I felt as if I really knew the people in the story by the time I got to the end of the book. The author also did a good job in describing the setting of this story and the scenes were vivid so you felt as if you were a part of it. In this story you will read about ups and downs in the characters lives. I like how she made their story mimic real life. I am looking forward to more books by this author. I really liked the cover of this book. This looks like a place that I would love to sit down with a good book just like this one to read on a nice day. It did not give any clues to the story but that is ok with me. Be sure to stop by Litfuse Group so see more reviews on this book. Just like with the rest of the series this was a good story. Even though this is the fourth book in this series you can read it as a stand alone but I think you will want to read them all together. I like how I feel as if I get a new chapter in the book each month. In this installment we get to know Emmie. 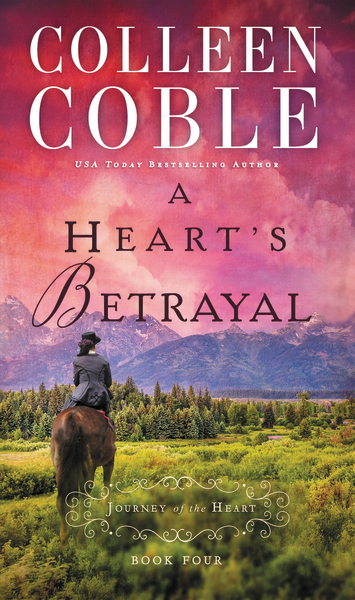 You find yourself really feeling for Emmie as the person she thought was her husband turns out has some secrets that are very heart breaking. So not only is she grieving his death but she is now dealing with the secrets. I like how Emmie and Isaac's relationship blooms in this book. 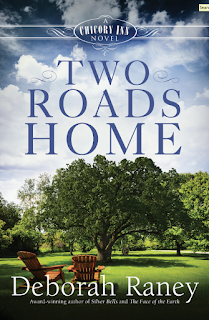 A very fast paced light read for a day at the beach or a rainy stay at home day. I like the color of this book. To me the covers of this series look like a very nice painting. The picture is something I would like to have in a print to hang on my wall. I enjoyed reading the first book in this series and thought it would be fun to read this one as well. Even though this is a part of a series you can read it as a standalone as well. This book is a good book to take to the beach for a light day of reading. The author does a good job with keeping you guessing until the end of the book. Meg “Jinx” seems to get herself into a lot of mischief as she goes about her life. You will have fun following Meg along as she tries to find out what happens to Chelsea and her hat. The characters in this book are so fun to have included in this story. I look forward to the next book in this series. I hate to say it but I am not fond of this cover. I like to have more of a "real" picture or an actual scene on the covers of my books. I think there is too much dead space. 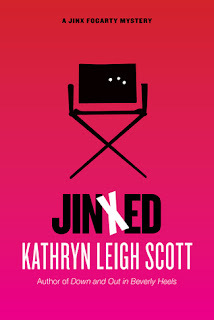 Writing and Acting have always been twin careers for Kathryn Leigh Scott. She has a recurring role playing George Segal's girlfriend Miriam in The Goldbergs, and appears in the 2015 mid-season launch of Marvel's Agents of S.H.I.E.L.D. Her most recent novels are the mysteries JINXED and DOWN AND OUT IN BEVERLY HEELS. Kathryn, who wrote the novel DARK PASSAGES based on Dark Shadows, appears in a cameo role in Tim Burton's Dark Shadows, starring Johnny Depp. Her latest nonfiction title is DARK SHADOWS: RETURN TO COLLINWOOD. Hampshire and Rachel Drummond. Kathryn wrote DARK SHADOWS MEMORIES to coincide with the show's 20th anniversary and DARK SHADOWS COMPANION as a 25th-anniversary tribute. Book) and LOBBY CARDS: THE CLASSIC COMEDIES, both of which were published in the U.K. by Bloomsbury. Kathryn's theatrical credits include a lengthy run with James Stewart in Harvey in London's West End. She has appeared in many television series and mini-series, including Barbara Taylor Bradford's Voice of the Heart, as Dan Travanti's wife in Murrow, as George C. Scott's mistress in The Last Days of Patton, as Philip Marlowe's girlfriend in Chandlertown, and as a series regular with Brian Dennehy in Big Shamus, Little Shamus. Feature films include Providence, The Great Gatsby, Brannigan, The Greek Tycoon, Assassination, 187, Parasomnia, Dr. Mabuse, Dark Shadows, and more. Kathryn maintains homes in Los Angeles and New York. Pomegranate Press recently issued a trade paper edition of COYA COME HOME, with a foreword by Walter F. Mondale. 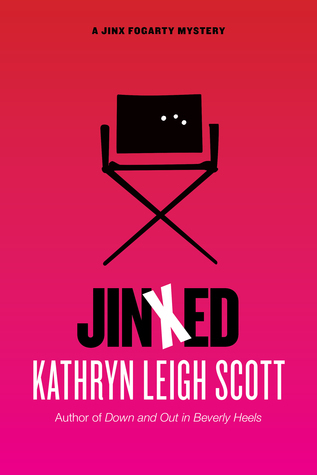 Kathryn has written three novels, DARK PASSAGES (2012), DOWN AND OUT IN BEVERLY HEELS (2013), JINXED (2015), and a forthcoming memoir, LAST DANCE AT THE SAVOY. This was a fun mystery for me. I have not read any of the other books in this series or by this author and I did just fine and did not feel lost. There is murder, mystery, romance and animals all in one place – what more can you ask for in a good book. The characters are very well developed and likeable. It was fun learning a little about each of them as the story went along. One of my favorite things was how Pru could “communicate” with the animals. This brought a little humor to the story. It was also kind of neat how the animals would give her clues to try and help her solve the mystery. The author did a good job of keeping me guessing until the end of the story. I will be looking for the rest of this series to enjoy. 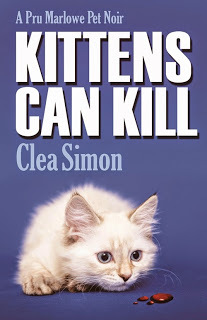 I liked the little kitten on the front of the book. The only thing is that I wish there would have been a little something in the background behind the kitten. 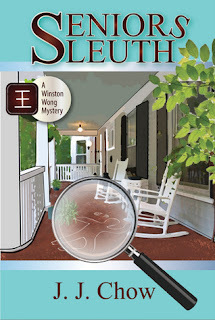 This was a fun quick mystery to read and a new good series. I like how the author included a little humor along with the mystery solving. The characters were very fun and unique. There are just enough twists that you will find yourself guessing right up until the last part of the book. It was kind of fun to see the video game world collide the retirement world. These are two parts of the world that normally do not go together but the author did this meshing of the two in a nice way. This is a perfect book for you take to the beach for a good day of reading. Jennifer J. Chow, an Asian-American writer, holds a Bachelor's degree from Cornell University and a Master's in Social Welfare from UCLA. Her geriatric work experience has informed her stories. She lives in Los Angeles, California. Her multicultural women's fiction, The 228 Legacy, was a 2013 Finalist for ForeWord Reviews' Book of the Year Award. She also writes the Winston Wong Cozy Mystery Series under J.J. Chow. I enjoyed reading this book as it gives you a new way to look at food. This is not your normal so called diet book. It is more. It teaches you how to change your eating habits and it more of a lifestyle change. You can tell by reading this story that the author is very passionate about what she is writing about. This makes it so much easier to read as you kind of felt as if you were sitting in a room talking with her. I like that the author included illustrations as it made things a little easier to see and understand. There are some good recipes included that are simple to make and tasty to eat. 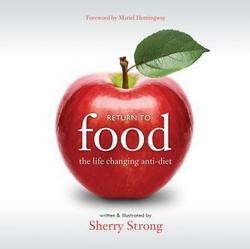 She makes eating right just make sense and after you read this book you will find you changing your habits for the good. I recommend this book for all who are looking to make a lifestyle change and wanting to start eating healthier. Eating in nature makes this simple as those foods that are more easily obtained in nature, in their natural state have all kinds of nutrients and protective qualities that cushion any addictive properties. Once we strip the nutrients and protective properties through cooking and processing, the more we can eat and the bigger the buzz they give us. They also have a corresponding dip in relation to the buzz and this triggers us eating for the buzz and again to compensate for the loss of nutrients and sensation of wellbeing. In most cases with processed food it is not really wellbeing but a drug like spike we often mistake for wellbeing. Choose a healthier though and you’ll feel a healthier more empowering feeling. Choose to walk instead of sit on the couch and eat food that is dead and addictive while watching television that is negative and you will set in motion literally thousands of different reactions in the body that set yo up for better life decisions. We think it is about the food and this allows us to be sold diets and products that do for us what our body is infinitely more capable of doing. You have an innate wisdom and intelligence that far exceeds any diet or textbook on eating. Tap into the stream of wellbeing your body is set up to thrive on and you’ll automatically be attracted to foods that facilitate, healing, weight loss and energy beyond what you can imagine.